I think this chart eloquently sums up the cost to a society of a fiat currency. In it you see that as time goes by, thanks to technological advances the productivity of workers steadily increases. You would expect that productivity to eventually flow through to the workers of the nation in terms of higher real wages. That is what happened up until Nixon cut any ties to the pseudo gold standard in 1971. From that date the US has had a purely fiat currency. The result: For 40 years the Federal Reserve System has confiscated the improvement in wages through inflation. 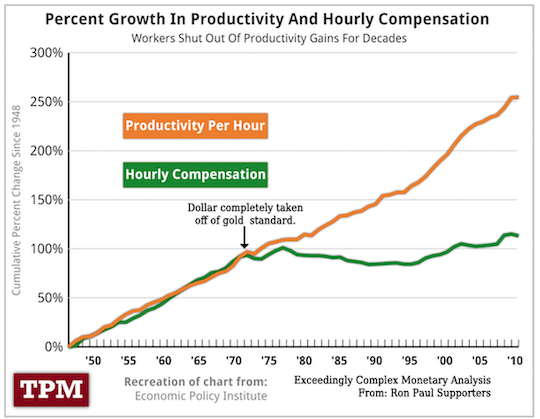 In that time frame the productivity of each worker has tripled. The hourly wages of each worker should have tripled as well in real terms. You thought you were angry because the government took half in taxes. That is a smoke screen for the real theft. They take 2/3 of your wages through this process, and then what's left they take half in taxes. It is certainly no wonder that politicians who advocate ending The Federal Reserve System like Ron Paul are gaining so much popularity. So if the money has been stolen from the workers, where did it go? The banks of course. When they print money, they get to use it. they get something for nothing. The cost is it causes inflation and that means wealth is stolen from the middle class.